[News from the News Center] On March 25-27, the 2019 CDIO Asian Regional Conference & the International Symposium on Reform and Development of Engineering Education in New Technology Age was held in Dalian by Dalian Neusoft University of Information. Over 300 scholars from universities home and abroad and professionals from a range of industries, including foreign guests from Australia, Singapore and Japan, gathered in the coastal city to contribute their insightful thoughts. YSU delegation led by Vice President Zhao Yongsheng attended the conference. Zhao Yongsheng gives a keynote speech. With the theme of Reform and Development of Engineering Education in New Technology Age, this conference includes thematic reports, parallel forums and member conferences. 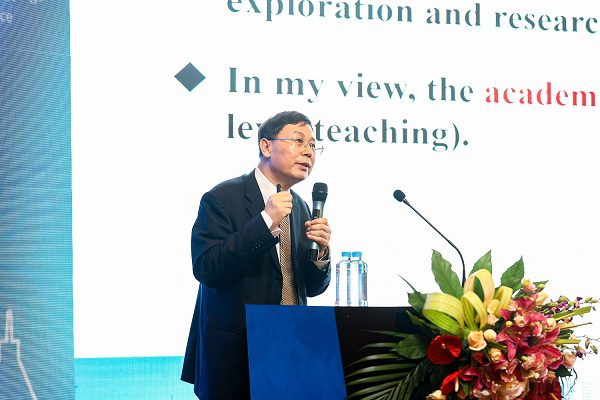 At the conference, Zhao Yongsheng made his keynote speech in English titled PBL—The Best Teaching Model for Higher-order Thinking Skills. In the report, Prof. Zhao clarifies the connotation and significance of high-order thinking skills and its cultivation mode under the background of China’s new engineering education reform, and takes the project-based teaching of YSU as an example to further clarify the methods and paths of its realization. Associate Prof. BianHui from the School of Mechanical Engineering, and Prof. Liu Fucai from the School of Electrical Engineering, gave special reports on the parallel forum. Lu Jun, Coordinator of YSU international CDIO engineering education attended the conference and reviewed the application of University of Electronic Science and Technology of China for membership, listened to reports on the preparation for the 2019 International Conference in June, 2020Asian Regional Conference, and the 2020 International Conference, and also discussed the plan of CDIO in 2030 year. The conference has collected the achievements of engineering education reform and research in the field of education at home and abroad. It has received more than 160 papers from scholars in universities and colleges from Japan, Singapore, Vietnam, Mongolia, Kuwait, Malaysia, Thailand and other countries. After review, 44 papers were singled out for publication, among which four were from YSU. YSU has been actively involving in the Asian Regional CDIO Conferences, and discussing exchanging ideas with the domestic and international scholars and experts on the current situation and future of the engineering education, the demand for engineering talents cultivation in new economic and social environment, the cooperation of engineering education in Asia area and other issues, which further expands YSU’s influence as a central member of the CDIO in Asian region.